Wafer-based silicon photovoltaic (PV) production has only changed slightly in the past forty years. The standard concept comprises p-type silicon wafers, fired contacts and encapsulation. Cost reduction is necessary if PV has to survive without feed-in tariffs and be competitive with grid electricity costs. Therefore the levelized cost of electricity (LCOE) is one of the primary metrics for the cost of electricity produced by both utility scale and distributed power systems. The fastest path to lower LCOE is to introduce high efficiency solar cell concepts like the heterojunction technology (Si-HJT). Heterojunction cell technology combines the advantages of mono crystalline silicon (c-Si) solar cells with the good absorption and the superior passivation characteristics of amorphous silicon (a-Si) known from a-Si thin film technology using readily available processes and materials. The structure of a Si-HJT cell is simple and its core is the thin intrinsic a-Si layer deposited between the c-Si wafer and the doped layers which is the key to achieve maximum performance. The skillful deposition of an intrinsic a-Si layer results in reduced interface state density and surface recombination current (J0 ~1 fA/cm2) and hence decreased surface recombination losses. The relatively straightforward Si-HJT production process takes place at low temperatures and requires fewer production steps compared to other high efficiency designs, which is economically attractive as it results in significant energy cost savings. An important technological advantage of Si-HJT cells is the excellent surface passivation of a-Si which enables high open-circuit voltages and high cell efficiencies. The superior temperature coefficient of TC = -0.2 %/K ensures higher energy yield during module operating. As previously mentioned, low temperature processing (<250°C) saves energy during manufacturing, prevents bulk degradation and allows the use of thin wafers. Integrated development throughout the PV value chain (diamond wire wafering, heterojunction cell technology and SmartWire Connection Technology (SWCT) ) guarantees the maximum performance of HJT systems. 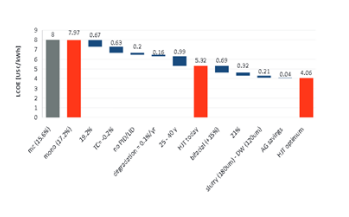 Already today HJT systems deliver higher kWh/m2 compared to other technologies as shown in the first figure below, and this especially in the case of bifacial modules. In combination with the low manufacturing costs, this translates into reduced LCOE as shown in the second figure below. Moreover, we are at the beginning of Si-HJT mass production and further improvements are foreseen. The use of thin wafers, the reduction in manufacturing costs and performance improvement at the cell and module level will bring the cost of electricity generated by Si-HJT systems at a close to unbeatable low level. 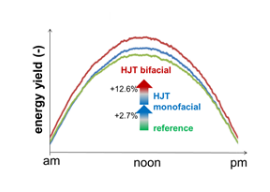 Figure 1: kWh/m2 generation of monofacial and bifacial Si-HJT systems vs homojunction technology. Figure 2: LCOE from homojunction technologies to already available Si-HJT and to future Si-HJT systems.